Qualification: (i) Matriculation with Hindi or Sanskrit. (ii) Holding transport vehicle driving license along with minimum of 2 years of experience of driving a heavy goods vehicle including proficiency in driving a heavy passenger Motor Vehicle or 10 years experience of driving a vehicle in armed forces. Qualification: (i) Matriculation with Hindi or Sanskrit. (ii) Should hold valid Conductor's Licence on cut off date. Stipend : The Executive Trainee, Junior Engineer (Trainee) & Plant Assistant (ITI) Trainee shall be paid a fixed monthly stipend @ Rs.15600/- & Rs.5200/- respectively during the training period. Application Fee : Rs.500/- (Rs.50/- for SC/ST/PWD), should be paid at any branch of the Syndicate Bank in the prescribed payment challans. Keep original counterfoil of the challan with you as it is to be produced at the time of written test along with call letter. Qualification : Gradute in Arts / Science and must have proficiency in operation of computers (Word Processing and Spread Sheets). Pay : Rs. 30000/- per month consolidated. Qualification : Full time B.E/ B.Tech or equivalent qualification in civil discipline with minimum 60% marks in aggregate from recognized Institute/ University. School of Computing : All areas in Computer Science and Engineering. Electrical Engineering - especially but not limited to electronics and communications. School of Engineering : Solid Mechanics, Engineering Design and Manufacturing. Online applications are invited for appointment in Officer cadre and Office Assistant Cadre in Rajasthan Gramin Bank. Fee : Rs.500/- (Rs.100/- for SC/ST) to be deposited in Rajasthan Gramin Bank/ Punjab National Bank through payment challan. Application Fee : Demand Draft of Rs.500/- of any Nationalized Bank drawn in the favour of "Anand Agricultural University Fund Account", (Application Form fee is exempted for SC/ST/SEBC candidates of Gujarat). State Bank of India is looking for Professionals with suitable Domain Expertise to provide relevant inputs in respect of Project Finance proposals, under various business verticals viz., Project Finance Group, Corporate Accounts Group and Mid Corporate Group and keep these Group abreast of development in respective sectors at all times. Application Fee : DD of Rs. 500/- in case of General and OBC category payable on any nationalized bank in favour of the Finance Officer, Jawaharlal Nehru University payable at New Delhi. 4) ESI PGIMSR Rajaji Nagar, Bangalore. Now Government has decided to take a common test for the posts of Teachers (Primary or Elementary level) in all schools of Central Government like Kendriya Vidyalaya (KVS) (Central Schools) , Navodaya Vidyalaya, Tibetan Schools etc. and schools of Union Territories like Chandigarh and Andaman & Nicobar Islands etc. This may be extended or adopted by private schools for teacher recruitment. The responsibility of this examination is given the Central Board of Secondar Education (CBSE). CBSE has come with the notification of Central Teacher Eligibility Test (CTET) - January 2012 to be held on 29/01/2012. All those who want to make a career as a teacher, must appear in this exam as this is very good opportunity. Application Fee : Rs. 500/- (Rs.250/- for SC/ST/PWD candidates) Through Credit / Debit Card/ Demand Draft in favour of the Secretary, Central Board of Secondary Education, Delhi drawn in any Nationalized Bank payable at Delhi. Write your registration number, name, address, and mobile/telephone number on the back of the Demand Draft. Applications are invited for the posts of Prashikshit Snatak (Trainged Graduate Teacher -TGT) and Lecturers in Government Aided Non Government Inter Colleges and High Schools in UP. Prashikshit Snatak (प्रशिक्षित स्नातक) (Trainged Graduate Teacher -TGT) : 1197 posts in various subjects, Age : 21 - 30 years, Pay School : Rs. 15600 - 39100 grade pay Rs. 5400/-, Qualification : Graduate in relevant subject and B.Ed./ L.T/ BT/ Shiksha Shastri etc. Pravakta (प्रवक्ता) (Lecturer) : 317 posts in various subjects, Age : 21 - 30 years, Pay School : Rs. 15600 - 39100 grade pay Rs. 5400/-, Qualification : Post Graduate in relevant subject. Application Fee : An Account Payee Demand Draft of Rs.250/- drawn on any Nationalized Bank, in favour of Steel Authority of India Ltd – IISCO Steel Plant payable at Burnpur. Rs.50/- for SC/ST/PH candidates. Application Fee : Rs. 300/- (Rs. 50/- for SC/ST& PWD candidates) to be deposited in SBI through a payment Challan form in cash. How to apply : Duly filled in application in prescribed format should be sent so as to reach the Chief General Manager, Human Resources Development Department (HRDD), Small Industries Development Bank of India, Head Office, SIDBI Tower, (II Floor), 15, Ashok Marg, Lucknow - 226001 on or before 11/12/2011. Application Fee : Rs.450/- (Rs.50/- for SC/ST/PWD) to be deposited through payment challan in UCO Bank. 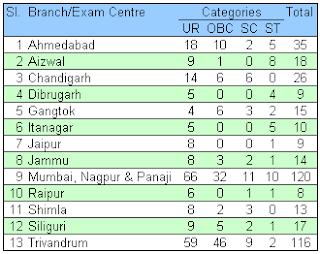 Selection by Written Test to be held on 01/01/2012. How to Apply : Apply Online at Careers and Job Openings section at MahaTransco website http://www.mahatransco.in from 08/11/2011 to 29/11/2011. For more information and apply Online, please visit , Careers and Job Openings section at MahaTransco website http://www.mahatransco.in from 8th November 2011. Qualification : Graduate from a recognised University. Preference will be given to the candidates having Degree /Diploma in Marketing/Management. Good working knowledge of English and Hindi is must. Knowledge of Power Point/ Word / Excel will be added qualification. Age Limit : 21-35 years. Age relaxation as per rules. Qualification : Matriculation or equivalent from a recognized Board/ University. For Driver : Should possess "Transport vehicle driving license and pass the driving test. For Fitter : Should possess a certificate from ITI or any other recognized institution in the trade of Auto mobiles fitters/ motor mechanic and should have one year experience. However, wards of CRPF, who have undergone training in ITI run by CRPF will be exempted from one year practical experience. Their technical knowledge and aptitude for the job should be considered for their enrolment in CRPF. For Other Trades i.e., Bugler / Tailor / Brass Band / Cobbler /Carpenter / Gardener / Painter / Cook / Water Carrier / Safai Karmachari / Barber / Washer Men should be proficient in respective trades. Pay Scale : PB-1 (Rs. 5200 - 20200) + Grade Pay of Rs.2000/- plus usual allowances as admissible to Central Govt. employees from time to time. Tech Mahindra looking for experts in WLAN, firewall, and layer2 security protocols at Bangalore. Experience with Network Programming, TCP/IP, UDP, Sockets and related. Proficient in multi purpose and multi-threaded programming. Development experience in Datacom product- feature development. DOCSIS specifications, Packet Cable specification, DOCSIS 3.0 features, such as Channel Bonding, Multicast etc. Strong Debugging capabilities and exposure to debugging and Testing tools. Online applications are invited for direct recruitment to the post of Security Assistant (Executive), General Central Service, Group C Non-Gazetted, Non Ministerial in various subsidiary in the Intelligence Bureau (Ministry of Home Affairs), Government of India. Qualification : i) Matriculation (Class X) or equivalent from the Recognized Board. ii) Candidate must have the knowledge of local language/ Dialect as specified above against each SIBx/ centers of Examination. Name of the Post : Executive Trainee (Electrical). Age limit is maximum 28 years. Candidates who are willing to apply should done B.E./ B.TECH/ B.Sc (Engg.) in Electrical/ Electrical and Electronics / Power Engineering OR AMIE in electrical with minimum 65% marks. Candidates with valid GATE - 2012 Registration Number need to apply online at Power Grid Corporation of India website. 225 in discipline of Mechanical/ Chemical/ Civil/ Electrical/ Metallurgy/ Instrumentation/ Computer Science and Information Technology. Note : After successful completion of training GAEs are appointed as engineers. Age limit is maximum 26 years (relaxation in age as per government rules). Application in the prescribed format for the following post of Senior Scientific Assistant in Directorate of Plant Protection, Quarantine and Storage. Educational Qualification : The candidate must be B.Sc Agriculture. Age Limit : The age limit is of 18-25 years. Fee Payable : Candidate have to submit the fee of Rs.50/- (No fee for SC/ST/PH/Women/Ex-Servicemen) Only through Central Recruitment Fee Stamp (CRFS), available at Post Offices. Food Corporation Of India (FCI) issued the recruitment notification for requirement of 3598 Assistant Grade III, 35 Assistant Grade II and 122 Typist positions for five zones in India. How to Apply : Candidate have to apply online on the SSC website OR send the application form after filling to the Regional/Sub-Regional office of the SSC.